Discover a varied offer of budget beach tours that will take you through some of the most renowned destinations such as Sydney and Byron Bay. Each affordable tour will provide you with memorable moments for some of the lowest prices on the market. "Was brilliant experience and the instructors are all sound! Was way worth it, was..."
"Fantastic trip with great itinerary, clean and lovely accommodations, nice meals..."
"I joined Australian Surf Tours for their 1 week surf camp in March. I wasn't sure..."
"I did this tour at the beginning of September, I loved it so much. I met my guide..."
"Had an incredible 6 days at spot x! 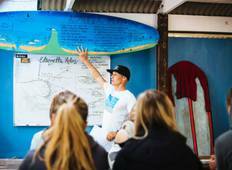 Our guide V was so welcoming from the start and..."
"I had the best time surfing at Byron. The instructors were so helpful and well qualified...."
"The trip was amazing, good range of food, ideal location, very helpful instructors...."